After a long winter in the Great White North, you’ll no doubt be ready to welcome the spring season. But if you’re a homeowner in Ontario or elsewhere in Canada, the start of spring marks the start of a tradition known as spring cleaning. The wintertime can really do a number on your property, so the start of spring will give you an opportunity to get things in order. If you’re in need of windows in Midland, ON, spring is a great time to book an appointment at a replacement window store. But, otherwise, one of your spring cleaning chores will be to clean the windows you have in place. Here are 4 things you should pay special attention to this spring. When it comes to your windows, proper maintenance includes washing them periodically using a quality glass cleaner. After you’ve cleaned the windows, use paper towels or a soft piece of cloth to properly clean and dry the interior of the windows. It’s okay to use a garden hose to clean off the exterior of the windows. You should also take the occasion to clean your window screens. You only need to do the screens annually, so you can include it in your spring cleaning plan. Depending on how dirty the screens are, you can either vacuum them or hose them down. Once the snow is all gone, you can inspect the roof to ensure that everything’s okay. If you find loose or missing shingles or any other signs of damage, reach out to a professional roofing company for guidance on how to proceed. Tackling the problem right away could save you lots of money down the road, so don’t allow such problems to get worse due to inaction. Does your home have siding? A good pressure washer will help you to lift the dirt and grime deposited during the winter season. A garden hose won’t pack the same sort of power that a pressure washer will, so borrow, rent, or buy a pressure washer to clean the siding of your home. While you’re at it, use the pressure washer to clean your driveway, patio deck, and outdoor furniture. If you’re like most people, your garage became a little more – or a lot more – crowded during the winter. You’ll want to put the shovels away, the snowblower away, and the bags of salt away. Get rid of anything that you won’t use again, and simply aim to reduce the clutter. Cleaning your windows this spring is a great idea, but replacing older windows that are no longer functioning properly is an even better idea. 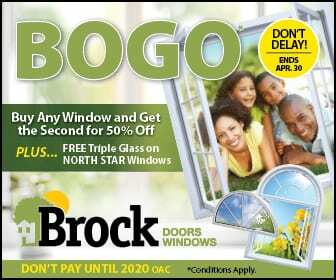 Contact us at Brock Doors and Windows Ltd. for the Midland, ON windows you need for your home. Stop by our Innisfil office at any time. You can find us at 2347 Industrial Park Rd Innisfil, ON L9S 3V9. You can also phone us at (705) 431-7087 to speak with one of our employees. We’ll be happy to help you get the windows you need.